Dr. Sandeep Kumar will present "Functionalized nanomaterials for environmental & healthcare applications" on Thursday, January 24 @ 4:00pm in Fisher Hall Room 139. The modern material technology has seen remarkable advances in device fabrication and has facilitated the use of advanced functional materials and their hybrids for various applications ranging from energy, environment, electronics, healthcare and agricultural sector. The utilization of different nanomaterials for specific application depends upon fulfillment of numerous requirements that are achieved mainly with their surface modifications. Toxicity of nanomaterials itself poses challenge and required to be assessed adequately before using them for variety of healthcare applications. The present talk will focus on utilization of some nanomaterials for environmental and healthcare applications. The nanomaterials utilized for specific application are synthesized and characterized well for their topography, morphology, chemical nature and stability. The work related to usage of prominent nanomaterials for sensing of important water contaminants will also be discussed. 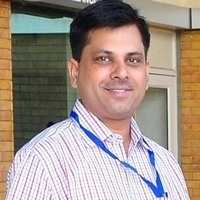 Dr. Sandeep Kumar (faculty at Department of Bio and Nano Technology, Guru Jambheshwar University of Science and Technology, Hisar, Haryana, India) is presently working as Water Advanced Research and Innovation (WARI) Fellow at Department of Civil Engineering, University of Nebraska-Lincoln (UNL), Nebraska, USA under program supported by the Department of Science and Technology (DST), Govt. of India, University of Nebraska-Lincoln (UNL), and Indo-US Science and Technology Forum (IUSSTF). His current research interests include synthesis and characterization of nanomaterials, nano-carriers for healthcare applications, nanomaterials based sensors, biomaterials and nanotoxicity. Dr. Kumar has published more than 100 research papers in international journals of repute. Dr. Kumar has international and national sponsored research projects from different funding agencies like NRF, MOST, ADAMA, DST, DBT, DRDO, HSCST, etc. Dr. Kumar is a visiting Professor at Hanyang University, Seoul, South Korea. Dr. Kumar has received Haryana Yuva Vigyan Ratna Award in 2017.